Cooking Basmati Rice in the pressure cooker or electric rice cooker is convenient when you want to cook large quantity or when you do not have time to watch it. Cooking basmati rice in cooker is a simple and easy process. But some care needs to be taken as basmati rice is a delicate long grained rice. 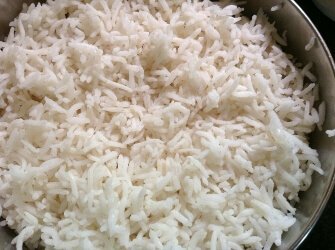 The amount of water you add and the time you cook is important to get a perfect rice where each grain is cooked but separate. We do not want mushi, overcooked rice. If you are planning to mix cooked rice with vegetables, paneer etc, where it cooks further, as in fried rice or tawa pulao, you want rice just cooked so that it does not break when you mix it with vegetables. Ghee or oil keeps the grains separate. Lime juice keep rice white and enhances taste. The ratio of rice to water is generally 1:1/2 when you are using basmati rice. Generally one year old rice is used in most dishes. You may use up to 2 cups of water for 1 cup of rice depending on the oldness or the newness of rice. New rice needs less water and cooks soft. Old rice needs a bit more water than new rice. Using more water will overcook the rice and make it too soft to handle and will break the grain. Whether you are cooking rice is an electric rice cooker or in pressure cooker, or on the stove top, the following steps need to be done before cooking rice. 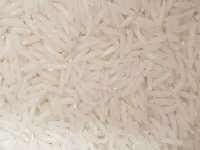 Take rice in a plate and remove any impurities such as stones, sticks etc. if any. Now a days you get good, precleaned rice so you may not need to do this step. Take rice in a bowl. Add plain water and wash rice using your fingers. Pour out the whitish water carefully. In the same way wash rice 2-3 times till water runs clear. Add 1 1/2 cups water to the washed rice. Leave aside the washed rice bowl for 20-30 minutes. Cooking rice in a rice cooker may be helpful when you need to make rice in large quantity of rice. You also do not need to watch it while it is cooking. Follow the rice cooker manufacturer's directions. Put washed and soaked rice along with the water in the rice cooker. If you are adding any of the optional ingredients, add them now. Place the lid and switch the cooker on. The cooker will switch off automatically when the rice is done (may take about 20 minutes). The cooker will turn on again at intervals to keep the rice warm if your rice cooker has that warming function. Serve hot within an hour or two. If left too long in the rice cooker, the rice may become dry. you need to make rice in large quantity of rice or . You want cook other items, such as lentils or vegetables by using separators along with rice. You do not need/want to watch it continuously while the rice is cooking in the pressure cooker. There is no need to mix anything in the rice while it is cooking. You add everything, vegetables or spices etc before you close the cooker. Add a cup of plain water in the pressure cooker. Put washed and soaked rice and water in the stainless steel vessel and keep that vessel in the cooker. Use 1 1/2 cup water for 1 cup rice. Place the lid and switch the stove on. Keep the heat high or medium high depending on the size of your pressure cooker. When the steam starts coming out from the vent, place the weight. When the pressure builds up and the whistle goes on, switch the flame off. Let cool on it's own naturally, which may take 10-15 minutes.By this time basmati rice will be perfectly cooked. Serve hot within an hour or two with curry, lentil curry. Adding a teaspoon of oil or ghee while cooking rice will make the cooked grain shiny and each grain will be separate. You can also add a teaspoonful of lime juice to the rice while cooking. It will also add to taste. Hope you find these how to cook basmati rice help useful. How to cook basmati rice on the stove top?